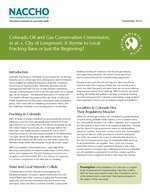 A recent NACCHO case study examines the legalities of the fracking ban issued in Longmont, CO, in 2012. Fracking is a technique the oil and gas industry uses to extract gas from underground shale formations by injecting water, chemicals, and sand into an underground well with the use of high-pressure machinery. The case study helps LHDs understand the legal issues surrounding such a ban, including preemption, evaluation of claims, and the challenges of issuing a ban or moratorium.